In testis, the immature male germ cells (spermatogonia) produce sperms by spermatogenesis. Spermatogenesis begins at puberty. The sprematogonia are present on the inside wall of seminiferous tubules. These cells multiply by mitosis and increase in numbers. Each spermatogonium is diploid and contains 46 chromosomes. Some of the spermatogonia; called primary spermatocytes; periodically undergo meiosis. A primary spermatocyte completes the first meiotic division; resulting in formation of two equal haploid cells; called secondary spermatocytes. A secondary spermatocyte has 23 chromosomes. The secondary spermatocytes undergo the second meiotic division to produce four equal, haploid spermatids. Spermiogenesis: The process leading to transformation of spermids into spermatozoa (sperms) is called spermiogenesis. After spermiogenesis, sperm heads get embedded in the Sertoli cells, and are finally released from the seminiferous tubules. This process is called spermiation. Hormonal Control of Spermatogenesis: The secretion of gonadotropin hormone (GnRH) increases significantly at the age of puberty. This starts spermatogenesis. The increased level of GnRH acts at the anterior pituitary gland and stimulates the secretion of two gonadotropins, viz. luteinizing hormone (LH) and follicle stimulating hormone (FSH). LH acts at the Leydig cells and stimulates synthesis and secretion of androgens. Androgens then stimulate the process of spermatogenesis. FSH acts on the Sertoli cells and stimulates secretion of some factors which help in the process of spermiogenesis. Structure of Sperm: Sperm is a microscopic unicellular structure. It is composed of a head, neck, a middle piece and a tail. The whole body of the sperm is enveloped in a plasma membrane. 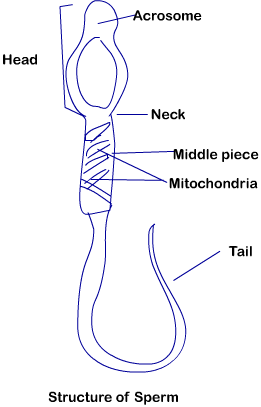 The sperm head contains an elongated haploid nucleus. The anterior portion of head is covered by a cap-like structure; called acrosome. The acrosome is filled with enzymes which help in fertilization of ovum. The middle piece possesses numerous mitochondria. These mitochondria produce energy for the movement of tail that facilitates sperm motility. Sperm motility is essential for fertilization. The human male ejaculates about 200 to 300 million sperms during coitus. At least 60% of the sperms must have normal shape and size, and at least 40% of them must show vigorous motility; for normal fertility. The process of formation of a mature female gamete is called oogenesis. Oogenesis is initiated during the embryonic development stage, i.e. when the female child is still in the womb. At this stage, a couple of million gamete mother cells (oogonia) are formed within each fetal ovary. These cells start division and enter into prophase-I of meiosis, and get temporarily arrested at that stage. These cells are called primary oocytes. Each primary oocyte then gets surrounded by a layer of granulosa cells, and then it is called the primary follicle. Secondary Follicle: A large number of primary follicles degenerate during the phase from birth to puberty. Thus, at puberty only 60,000 to 80,000 primary follicles are left in each ovary. The primary follicle gets surrounded by more layers of granulose and a new theca, and is now called secondary follicle. 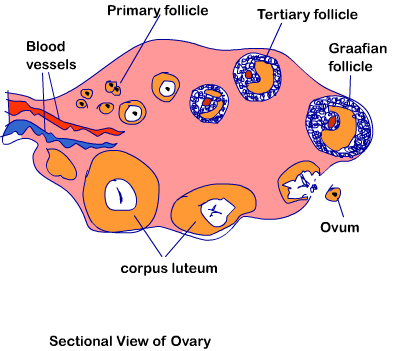 Tertiary Follicle: The secondary follicle soon changes into tertiary follicle. The tertiary follicle is characterized by a fluid-filled cavity called antrum. The theca layer is organized into an inner theca interna and an outer theca externa. At this stage, the primary oocyte (within tertiary follicle) grows in size and completes its first meiotic division. This is an unequal division which results in the formation of a large haploid secondary oocyte and a tiny first polar body. The secondary oocyte retains bulk of the nutrient rich cytoplasm of the primary oocyte. There is not enough knowledge on what happens to the first polar body. The tertiary follicle further changes into the mature follicle or Graafian follicle. Ovulation: The secondary oocyte forms a new membrane; called zona pellucid. The Graafian follicle now ruptures to release the secondary oocyte (ovum) from the ovary. Release of ovum from the ovary is called ovulation. Menstrual Cycle: The reproductive cycle in the female primates is called menstrual cycle, e.g. monkeys, apes and human beings. The first menstruation begins at puberty, and is called menarche. In human females, menstruation is repeated at an average interval of about 28/29 days. The cycle of events; starting from one menstruation till the next menstruation is called menstrual cycle. One ovum is released (ovulation) during the middle of each menstrual cycle. The major events of a menstrual cycle are: menstrual phase, follicular phase, ovulatory phase and luteal phase. Menstrual Phase: This phase is marked by menstrual flow and lasts for 3 to 5 days. Menstrual flow happens due to breakdown of endometrial lining of the uterus and its blood vessels. Menstruation only occurs if the released ovum is not fertilized. Lack of menstruation may indicate pregnancy. However, it can also be interrupted due to some other causes; like stress, poor health, etc. Follicular Phase: During this phase, the primary follicles in the ovary grow to become a fully mature Graafian follicle. At the same time, the endometrium of uterus regenerates through proliferation. These changes in the ovary and the uterus are induced by changes in the levels of pituitary and ovarian hormones. During the follicular phase, secretion of gonadotropins (LH and FSH) increases gradually. Gonadotropins stimulate follicular development as well as secretion of estrogens by the growing follicles. Ovulatory Phase: Both LH and FSH reach a peak level in the middle of the cycle, i.e. about 14th day. Rapid secretion of LH leading to maximum level during the mid cycle is called LH surge. It induces rupture of Graafian follicle, and thus the release of ovum. Luteal Phase: During this phase, the remaining parts of the Graafian follicle transform as the corpus luteum. The corpus luteum secretes large amounts of progesterone. This hormone is essential for maintenance of the endometrium. Such an endometrium is necessary for implantation of the fertilized ovum and other events of pregnancy. During pregnancy, all events of the menstrual cycle stop and there is no menstruation. In case fertilization does not happen, the corpus luteum degenerates. This causes disintegration of the endometrium; leading to menstruation which marks a new cycle.